Photo courtesy of used in book. Fisherman's Wharf, the district that stretches from Telegraph Hill to Fort Mason, was originally San Francisco's busy industrial area and fishing port. Today, it puts the tourist in touristy. Visitors can view a collection of authentic 19th-century ships at Hyde Street Pier or get a sweet taste of chocolate's history at the Ghirardelli Chocolate Manufactory and Soda Fountain. After you stuff yourself silly with the chocolate and fish (maybe not in that order) available at Fisherman's Wharf, burn off those unwanted calories by renting a bike at Blazing Saddles. Not only will you regain your good health, the bikes come equipped with a map that can take you all the way across the Golden Gate Bridge and into Sausalito. It's a trip not to be missed. If you're in mood for seafood, Fisherman's Wharf has endless options. But if it's the sweet and not the savory that you want to indulge in, head to nearby Ghirardelli Square, the closest thing California has to a Willy Wonka Chocolate Factory. And if you'd rather not have only chocolate for dinner (but why not - it's vacation! ), the Square offers several dining options, too, including always fun Lori's Diner. What do you get when you mix a bar owner, a travel writer, and a San Francisco mayor with his own dairy farm? Well, in 1952, after many failed attempts, you get the now infamous Irish Coffee, daily mastered and proudly served at the Buena Vista Cafe, the last stop on the Powell-Hyde cable car. With so many tourists descending on Fisherman's Wharf, you'll have plenty of hotel options that offer all the amenities. We're picking Sheraton Fisherman's Wharf because of their unique outdoor living room, an extension of the lobby that includes fire pits so guests can snuggle up outside, no matter how thick the fog. 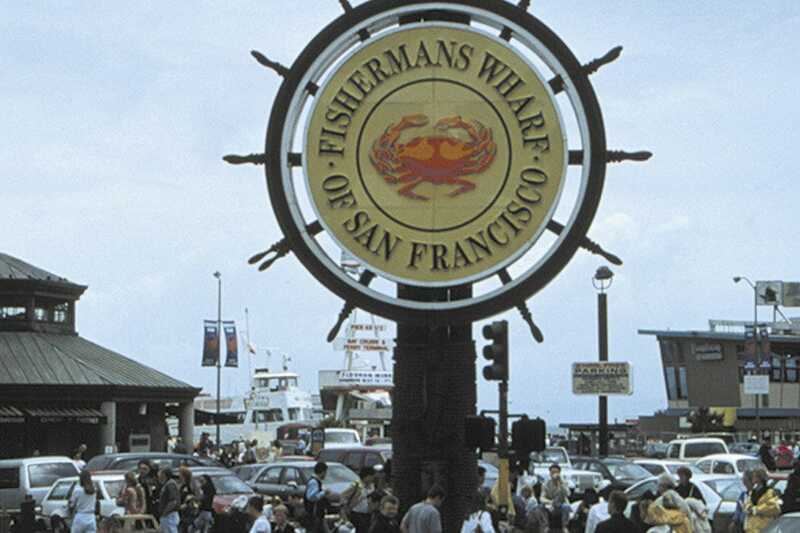 Let's be honest: all of Fisherman's Wharf is set up to get you shopping. Whether it's that must-have trinket from nearby Pier 39 or the classic "I Escaped From Alcatraz" T-shirt featured in at least a dozen shops, your tourist shopping needs are covered. We're highlighting the North Point Shopping Center because it offers some basics (Safeway, Walgreens, Radio Shack) that can become invaluable during a vacation.